More than 40 states have set statewide attainment goals for the percentage of adults holding postsecondary degrees or credentials by a certain year. These efforts have been sparked by Lumina Foundation’s 2025 national credential attainment goal – 60 percent of Americans holding a credential beyond a high school diploma by 2025. 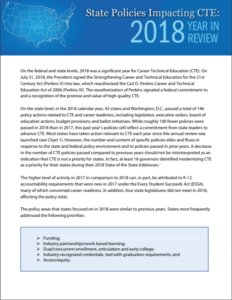 Some states have involved Career Technical Education (CTE) from the onset and others are now looking to ensure CTE is part of their overall strategy. 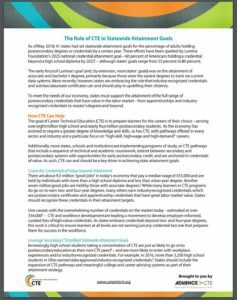 The new fact sheet released by Advance CTE explains why and how CTE can be a major driver of postsecondary attainment across the country. 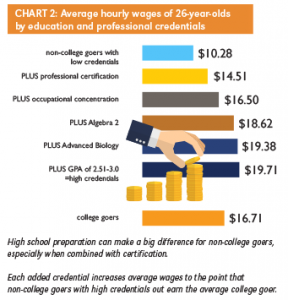 Count ALL Credentials of Value towards Attainment While many learners in CTE programs do go on to earn two- and four-year degrees, many others earn industry-recognized credentials, many of which have great labor market value. States should recognize these credentials in their attainment targets. Leverage Secondary CTE to Meet Statewide Attainment Goals: Increasingly, high school students taking a concentration of CTE are just as likely to go on to postsecondary education as their non-CTE peers – and are more likely to enter with workplace experiences and/or industry-recognized credentials. States should include the expansion of CTE pathways and meaningful college and career advising systems as part of their attainment strategy. Support Postsecondary CTE as a Platform for Credential and Degree Attainment: Postsecondary students enrolled in CTE programs have an average attainment rate of 56.8 percent (counting credentials, certificates and degrees at two-year institutions), well above the average graduation rate for two-year institutions. Bring CTE to the Table as a Partner: A statewide attainment goal can and should serve as the driver of a state’s economic and workforce vision, of which CTE must be a part. 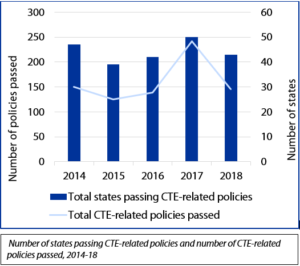 Read more about how Oklahoma, New Jersey and Tennessee have connected the dots between CTE and statewide attainment goals in the new fact sheet. On Thursday, December 7, dozens of education and workforce policy professionals attended the Credential Engine launch event to see something rare – a CEO, a union representative, a postsecondary representative and a foundation head agree with each other. The discussion, kicked off by Eleni Papadakis, Executive Director of the Washington Workforce Training and Education Coordinating Board, focused on the potential of the Credential Engine registry to catalog the thousands of credentials and certifications available in the United States and help learners and employers make sense of the credential marketplace. The registry works by encouraging states and other credential providers to upload their credentials (and their associated outcomes) to a common platform using common language and definitions. From there, employers, non-profits and others will be able to use the open source information to develop apps to integrate into their other systems. For example, an employer could integrate the information into existing human resources databases, or states could use the information to connect labor market demand with existing credentials that might meet the state’s needs. It is unclear how state or local governments will ultimately use this registry, or how well any of the apps developed will help learners understand not just what credentials are available, but which credentials are high quality. In fact, at the launch event, Jamie Merisotis, President and Chief Executive Officer of Lumina Foundation, expressed his desire that government agencies hold back for the time being on using Credential Engine to make policy or build credential accountability systems, and instead let the registry and related apps leverage market forces to test and build the functionality of the registry as an evaluation mechanism. While this platform is certainly still in its early stages, and much remains to be seen about how it will ultimately be used, there are a few promising indicators. The state of Indiana has already agreed to load healthcare credentials, New Jersey has agreed to load credentials from key industries onto the platform, and Credential Engine is working with the U.S. military to help translate military credentials into civilian equivalents. Additionally, more than 50 CEOs associated with Business Roundtable have committed to using registry data to meet employment needs. For more information on Credential Engine, check out their website here: https://www.credentialengine.org/ or join their next application showcase on January 18 at 2 pm EST. 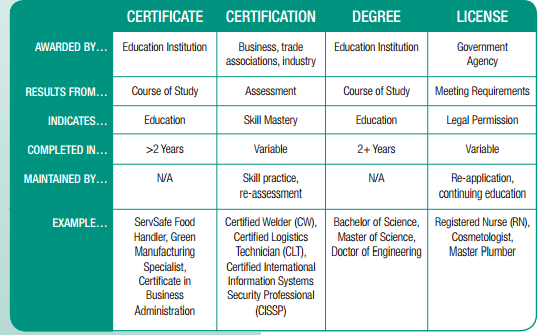 How Do States Identify and Endorse Industry-Recognized Credentials? Advance CTE today released a policy brief to help states get started in this work. The paper, titled “Credentials of Value: State Strategies for Identifying and Endorsing Industry-Recognized Credentials,” highlights promising practices from Florida, Kansas and Louisiana, which have each made considerable progress developing a system for students and employers to navigate the tangled universe of credentials. The brief further describes how each state tackles the challenge in a different way, building a system that suits their local economy and context, and highlights a few common strategies. For one, these states engage business and industry leaders early on in the process to verify that credentials are recognized and accepted in the labor market. This helps ensure that students are only pursuing â€” and states are only incentivizing â€” those credentials that have value. One example that the brief explores is in Louisiana, where regional teams are required to submit letters of endorsement from businesses in the state whenever they propose a new credential for the statewide list. From there, the process of vetting high-quality credentials often involves a concerted effort from a variety of different institutions. The brief describes how, in Florida, the state-approved credential list at the secondary level is developed with input from the Department of Economic Opportunity, the Agency for Workforce Innovation, the state’s workforce development board (an independent non-profit called CareerSource Florida) and the Department of Education. This ensures that the state can leverage the expertise of each agency to approve only those credentials that are valuable to students and to the economy. Another challenge the brief explores is that credentials available on the market today range in value, quality and the effort required to earn them. Thus, states have begun to recognize this difference and classify credentials based on their rigor and utility in the labor market. Kansas, for example, is examining a framework that categorizes credentials into three tiers: those required by law or regulation, those mandated by industry, and those preferred by industry. Even then, states should be prepared to adapt to fluctuations in the labor market or unforeseen problems with the credential review process. Take Floridaâ€™s Career and Professional Education Act (CAPE) for example. CAPE provided additional funding for teachers and school districts whose students earn state-approved credentials, but the state soon realized that the program was not structured appropriately to eliminate some gaming of the funding incentive. Over the years, Florida has gradually adjusted the funding formula to address these concerns and align incentives to encourage more students to earn high-quality credentials. With two-thirds of all new jobs projected to require some postsecondary education and training by 2020, there is a growing need for states to play a larger role in identifying and endorsing credentials of value. The number of high-demand jobs requiring an occupational license has grown over the past several years. This shift requires changes from the education community when considering the requisite training and preparation that students will need to enter these careers. A new report from the White House offers policymakers a framework for the growing field of occupational licensing as well some best practices to consider. More than one-quarter of U.S. workers now require a license to do their jobs, and most are licensed by their state â€“ which represents a five-fold increase since the 1950s. The share of licensed workers varies widely across the states from 12 percent in South Carolina to 33 percent in Iowa. Differences are largely due to state policies not occupational differences across the states. Also, licenses are just one type of credential that students can obtain in their educational journey, and with states working to meet the new Workforce Innovation and Opportunity Act (WIOA), understanding the different types is more important than ever. The Association of Career and Technical Education recently published a primer on credentials, in particular the postsecondary space between high school and a two-year degree. Check out the full brief here. Finally, the two-year degree attracts students of all ages, but which of those age groups are most likely to continue on to earn their bachelorâ€™s degree? A quick fact sheet from the American Association of Community Collegesâ€™ â€œData Pointsâ€ series has the answer. The Center for Public Education has analyzed the National Center for Education Statisticsâ€™ Education Longitudinal Study to look at a student group that is often ignored in major research studies â€“ the one in five students who do not immediately enroll in college after graduating from high school. Be sure to check out the first installment of this research series, which looked at the characteristics of this group. Earned a professional certification or license. Specifically, researchers found that advanced courses, such as Algebra 2 and advanced biology, and an CTE focus can have an impact on non-college going studentsâ€™ likelihood to have a good job and engage in society. If those same students earn a professional credential, then the scale shifts in favor of the non-college goer, meaning they are actually more likely to be employed, earn good wages and vote than their peers who attended college. Further, better preparation also had a greater impact on black graduates than their white and Hispanic peers, showing that higher credentials can be the key to closing the employment and wage gap. A new survey from Achieve asked college faculty and employers who teach or hire recent high school graduates about their preparedness for college and careers. This is the second release of Achieveâ€™s Rising to the Challenge survey. The first release, from late 2014, examined recent high school graduatesâ€™ views on their own preparedness. The full survey is an update to a similar survey Achieve conducted in 2004. The results reveal many parallels to the studentsâ€™ own responses â€“ in short, that there is a pervasive opinion that public high schools are not doing enough to prepare students for the expectations they will face in college and the workplace. Contrast those responses with those from the 2004 survey, and the picture becomes even bleaker. Offer more chances for real-world learning.